I've been wanting to make this recipe for quite some time now. I found this recipe for Praline Pecans with Cranberries years ago in and old cookbook (Gifts in a Jar for the Holidays) and I just kept forgetting to make it. This cookbook is filled with so many yummy gift ideas that you can give from you kitchen to family and friends. This book might be a bit of a challenge to find because it's 13 years old. I love pecans and I love dried cranberries, combined they looked so festive and pretty. 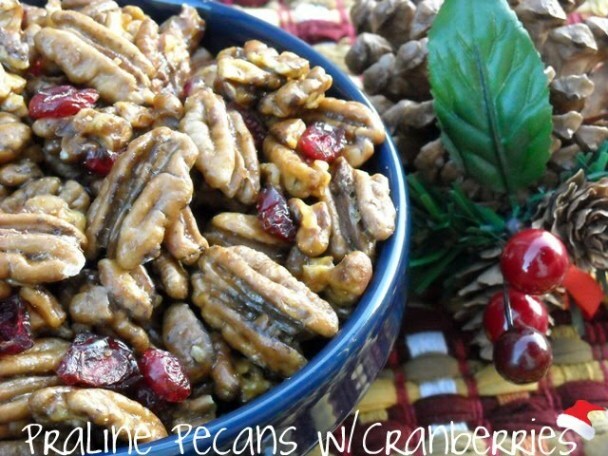 The pecans have such a nice flavor from the toffee coating and mixed with the sweetness of the cranberries makes them so delicious. I think this would be a nice last minute Christmas Gift for that special someone. There are a couple ways that you can package up this fruit and nut mix. First you can just place them in clear gift sacks and tie on a pretty ribbon with a tag or you can place it in a holiday tin or use a glass mason jar. 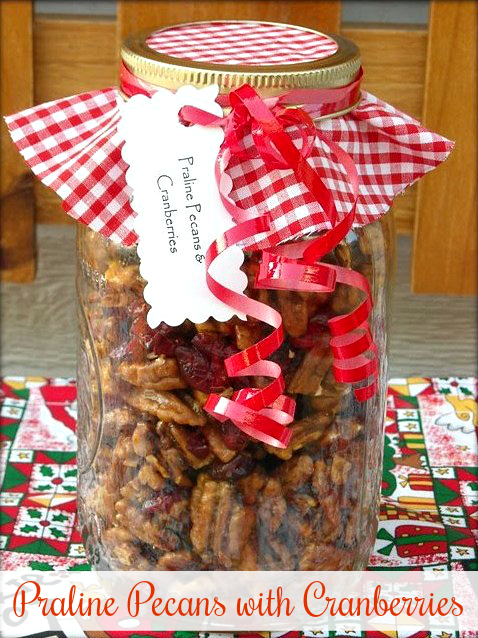 By far my favorite way to gift wrap this praline pecan mix is in a pretty quart size mason jar. You can add a color coordinating fabric circle, ribbon and a gift tag. I used a cereal bowl and traced out a circle from a piece of fabric and added the ribbon. I think this fruit and nut mix looks so pretty in jar and their perfect for gift giving. Let's get started on the step by step. Preheat oven to 250 degrees. Cover a large baking sheet with aluminum foil and set aside. In a large bowl combine corn syrup, sugar, and butter in a 2 quart glass measure or microwave safe bowl. Microwave on high for 1 minute. Stir, and microwave 30 seconds to 1 minute longer or until boiling rapidly. Stir in vanilla and baking soda until well blended. Add the pecan halves and mix together until all the pecans are coated. spread on the baking pan covered with foil. Cool completely and break into pieces. Add the dried cranberries or cherries and package up. Preheat oven to 250 degrees. Cover a large baking sheet with aluminum foil and set aside. In a large bowl combine corn syrup, sugar, and butter in a 2 quart glass measure or microwave safe bowl. Microwave on high for 1 minute. Stir, and microwave 30 seconds to 1 minute longer or until boiling rapidly. Stir in vanilla and baking soda until well blended. Add the pecan halves and mix together until all the pecans are coated. Spread mixture onto a greased baking pan and cook for 45 minutes mixing the pecans every 15 minutes. When done remove from oven and spread on the baking pan covered with foil. Cool completely and break into pieces and add dried cranberries or cherries. That looks like one of the most AWESOME homemade treats!! YUMMM!!! I can't wait to make it and give to friends and family. Thanks for all your great recipes! I think it looks so good in the mason jar!! This is my kind of snack. I love receiving homemade treats.... from SOME people. I think we all have those family members whom you wouldn't want to eat their goodies (I have an aunt and uncle who make jelly and are chain smokers and the jelly always smells like smoke). Not everyone's talented in the cooking department,but it's the thought that counts! Those look delicious! My family would love these! Thanks for posting the recipe. They look so good. I like the ones in the mason jar too! This looks yummy...I love pecans! Those look really yummy! I like the idea of adding cranberries to it. I made a similar treat this weekend, but it's the lean version. Next time I'm trying it with cranberries. Thanks for the idea. Tonight I made these for the 2nd time! I made 2 batches and added golden raisins along with the dried cranberries! I put them in a tin for each family member and the rest in a dish for everyone to eat tomorrow at our first round of Christmas! Thanks for the great recipes!! I love this idea. Have printed it for next year. Love your blog!! Merry Christmas!!!!!!!!!!!!!!!!!!!!! Thank you for this. I can't wait to make it! !